Butterflies, Blossoms, Blooms and a Bird all feature in this glorious cross stitch design. 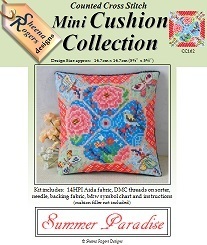 The mix of vibrantly bright colours and muted pastels are just wonderful to stitch with on a warm Summer afternoon, whether on holiday on a balcony overlooking the beach or curled up in that favourite armchair at home. Only whole cross stitch is required, with some backstitching needed for the finer details on the butterflies.